The Polish American Central Citizens Committee celebrated its 95th Anniversary with a day full of activities. The day started with a bus ride full of surprises. Due to the Detroit Free Press Marathon traffic, the wreath laying at the General Kazimierz Pulaski and General Thaddeus Kosciuszko monuments in Detroit took place with limited time at each. Despite the delays, participants arrived at St. Josaphat Church in time for the Noon Mass which was celebrated by Edmund Cardinal Szoka, and concelebrated with Monsignor Stanley Milewski. The traditional Mass was embellished by the Filarets Ladies Chorus under the direction of Bob Barnhart and the participation of the Knights of Columbus Honor Guard. Offerings during the Mass included a copy of the book published to commemorate the Central Citizens Anniversary, flowers, and a replica of the General Kazimierz Pulaski statue. Following the Mass, participants returned to the Polish National Alliance Council 122 Banquet Facilities in Hamtramck. With a quick snack and drink, participants greeted old friends and had the opportunity to meet new friends. The program began with greeting from the Central Citizens President, Stella Szczesny, and the introduction of Julius Szymczyk, who was the Master of Ceremonies for the balance of the afternoon. After the singing of the American and Polish National Anthems by several members of the Filarets Ladies Chorus, Hamtramck Mayor Karen Majewski presented Szczesny with a Proclamation from the City of Hamtramck. President Szczesny then read a Letter of Congressional Recognition from Congresswoman Debbie Stabenow. The final recognition was given by a representative from the Wayne County Executive Office, Robert Ficano. Monsignor Stanley Milewski then gave the invocation and prayer before the meal. Following the dinner, Dr. Thaddeus Radzilowski, President of the Piast Institute, spoke on the history of General Kazimierz Pulaski and his part in American History. The Central Citizens Committee was honored to have two of its past presidents in attendance, Mr. Roman Ulman and Retired Judge Benjamin Stanczyk. Each spoke of the historical impact during their tenures and of the need to continue the work of the Central Citizens Committee. In commemoration of their participation in this event, they were given silver medallions which were minted at the time when the Kosciuszko monument was being erected. As a surprise, President Szczesny also received a medallion. 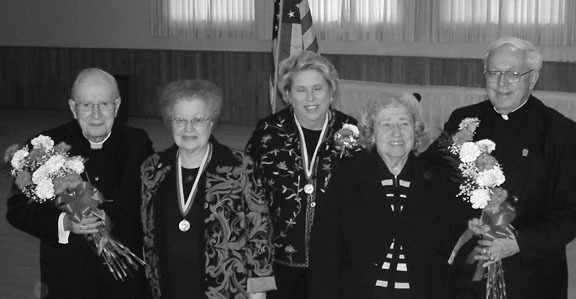 The annual Pulaski Day Banquet is hosted by the Polish American Central Citizens Committee and its primary purpose is to present the General Kazimierz Pulaski Medal to deserving members of Polonia. This year was no different. The Master of Ceremonies then called up each of the honorees and their presenters, in turn, to receive their medals. This year the honorees included, Bob Barnhart (Director of the Filarets Ladies Chorus), Tomasz Kielar (Choreographer for numerous Polish Dance groups), Dan Paletko (Mayor of the City of Dearborn Heights), Phillip Peczeniuk (former Hamtramck Police officer and supporter of Polonian organizations), Sebastian Szczepanski (Publisher of the Polish Times), and Miroslaw Wawrysz, (President of the Club Filarets Mixed Chorus). This year the Central Citizens Committee decided to honor organizations that are achieving their own anniversaries, rather than honoring a Non-Pole for their work in Polonia. The organizations that were honored this year were Club Filarets and the Orchard Lake Schools. Club Filarets will be celebrating its 75th Anniversary in the coming year. Miroslaw Wawrysz, President of the Club Filarets Mixed Chorus, asked former director Wladyslaw Budweil, and current director Dr. David Troiano, to join him in accepting the recognition. Monsignor Stanley Milewski accepted the recognition given to the Orchard Lake Schools. The Schools are celebrating their 100th Anniversary of moving to the shores of Orchard Lake and the 125th Anniversary of the founding of the Orchard Lake Schools. Final remarks by Central Citizens Committee President Stella Szczesny included thanks to those who worked to make the day a success and a reminder and invitation for everyone to attend the Annual Christmas Party that will take place on December 9th. Father Bogdan Milosz, pastor at Our Lady Queen of Apostles Parish, concluded the afternoon with a prayer thanking God for the work of the Central Citizens Committee and asking for guidance for the organization in the future. Photo opportunities and final goodbyes before leaving left everyone with smiles and good wishes for the future. Vice-President Barbara J. Gronet, Secretary & Treasurer David Ledwon; Trustees: Bernice Adamkiewicz, Lorraine Groman, Lillian Huczek; Board of Directors: Bob Bielenda, Reynold Bora, Alicia L. Ledwon, Edward Mandell, Mary Ann Nowak, Irene Raczynski, Ralph Raczynski, Thomas Schemanski, Julia Solecki, Julius Szymczyk; Public Relations: Jane Tylenda; Sergeants at Arms: John Grzesiak and Helen Wasacz; Flag Bearer: Patricia Bargowski. Honorary Directors are Roman Ulman and Benjamin Stanczyk. Monthly meeting are held at the PNA Council 122 Banquet Facilities in Hamtramck on the 3rd Friday of each month. For more information, call David Ledwon at (586) 773-2240 or Barbara Gronet at (313) 365-8949. The Polish American Central Citizens Committee celebrated its 95th Anniversary with a day full of activities. The day started with a bus ride full of surprises. Due to the Detroit Free Press Marathon traffic, the wreath laying at the General Kazimierz Pulaski and General Thaddeus Kosciuszko monuments in Detroit took place with limited time at each. Despite the delays, participants arrived at St. Josaphat Church in time for the Noon Mass which was celebrated by Edmund Cardinal Szoka, and concelebrated with Monsignor Stanley Milewski. The traditional Mass was embellished by the Filarets Ladies Chorus under the direction of Bob Barnhart and the participation of the Knights of Columbus Honor Guard. Offerings during the Mass included a copy of the book published to commemorate the Central Citizens Anniversary, flowers, and a replica of the General Kazimierz Pulaski statue. Following the Mass, participants returned to the Polish National Alliance Council 122 Banquet Facilities in Hamtramck. With a quick snack and drink, participants greeted old friends and had the opportunity to meet new friends. The program began with greeting from the Central Citizens President, Stella Szczesny, and the introduction of Julius Szymczyk, who was the Master of Ceremonies for the balance of the afternoon. After the singing of the American and Polish National Anthems by several members of the Filarets Ladies Chorus, Hamtramck Mayor Karen Majewski presented Szczesny with a Proclamation from the City of Hamtramck. President Szczesny then read a Letter of Congressional Recognition from Congresswoman Debbie Stabenow. The final recognition was given by a representative from the Wayne County Executive Office, Robert Ficano. Monsignor Stanley Milewski then gave the invocation and prayer before the meal. Following the dinner, Dr. Thaddeus Radzilowski, President of the Piast Institute, spoke on the history of General Kazimierz Pulaski and his part in American History. This year the Central Citizens Committee decided to honor organizations that are achieving their own anniversaries, rather than honoring a Non-Pole for their work in Polonia. The organizations that were honored this year were Club Filarets and the Orchard Lake Schools. Club Filarets will be celebrating its 75th Anniversary in the coming year. Miroslaw Wawrysz, President of the Club Filarets Mixed Chorus, asked former director Wladyslaw Budweil, and current director Dr. David Troiano, to join him in accepting the recognition. Monsignor Stanley Milewski accepted the recognition given to the Orchard Lake Schools. The Schools are celebrating their 100th Anniversary of moving to the shores of Orchard Lake and the 125th Anniversary of the founding of the Orchard Lake Schools. Final remarks by Central Citizens Committee President Stella Szczesny included thanks to those who worked to make the day a success and a reminder and invitation for everyone to attend the Annual Christmas Party that will take place on December 9th. Father Bogdan Milosz, pastor at Our Lady Queen of Apostles Parish, concluded the afternoon with a prayer thanking God for the work of the Central Citizens Committee and asking for guidance for the organization in the future. Photo opportunities and final goodbyes before leaving left everyone with smiles and good wishes for the future. The Polish American Central Citizens Committee is a service organization that was initially established to help recruit soldiers to serve under General Haller during World War I. Today the organization supports Polish and Polish-American organizations. The current officers of the Polish American Central Citizens Committee are: President Stella G. Szczesny, Vice-President Jerrold V. Marsh, Vice-President Barbara J. Gronet, Secretary & Treasurer David Ledwon; Trustees: Bernice Adamkiewicz, Lorraine Groman, Lillian Huczek; Board of Directors: Bob Bielenda, Reynold Bora, Alicia L. Ledwon, Edward Mandell, Mary Ann Nowak, Irene Raczynski, Ralph Raczynski, Thomas Schemanski, Julia Solecki, Julius Szymczyk; Public Relations: Jane Tylenda; Sergeants at Arms: John Grzesiak and Helen Wasacz; Flag Bearer: Patricia Bargowski. Honorary Directors are Roman Ulman and Benjamin Stanczyk. EVERY ONE THERE HAD A GREAT DAY. of the Central Citizens Committee. I am looking for Irene Raczynska from Posnan Poland. She was writing to my grandfather Eugene Karge during World War II. Are you related to her? Sorry I am not related to Eugene Karge. response to Mary Gilbet inquiry. and cannot particpate in the in this contest she will be in for a few more days. Audium Woods in warren, Michigan. Irene Raczynski is home and recuperating. health. I am coming along slowly. will be some outstanding persons. I have been entering the chance to win for over a year now but no results. But each day it encoures me to continue. Maybe something can happen on Autust 31, 2010.